“Big home, big car, big salary: this is the meaning of life? No! 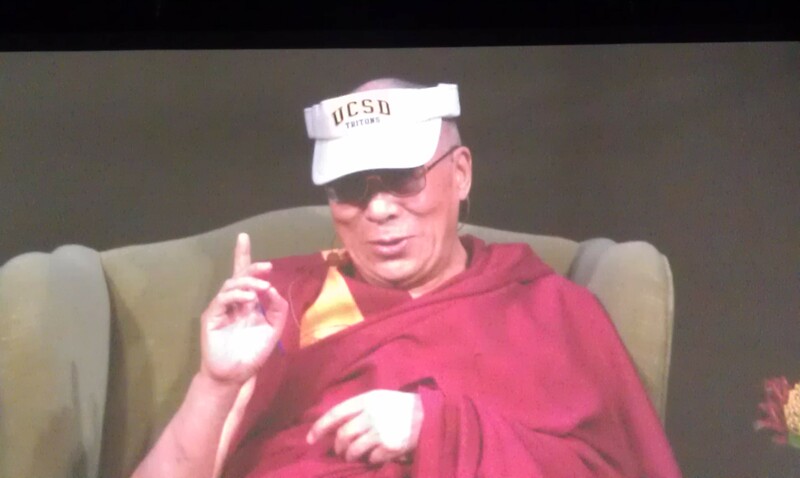 Certainly not!” Thus spake the Dalai Lama when he came to UC-San Diego last week. Material stuff fails to bring inner peace and happiness– but you knew that already. The main topic of the talk was the environment, and he infused all kinds of philosophy into the discussion and tied it all together. 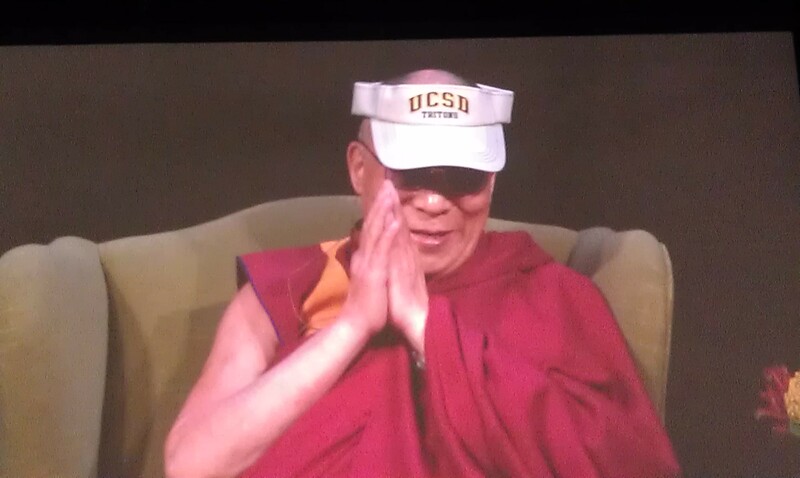 Two UCSD environmental scientists spoke before the Dalai Lama. He applauded them and said they were well prepared, but said he himself was too lazy to prepare a speech. Instead he told anecdotes, for example when he lived in Tibet, you could drink from the streams. But when he was exiled to India, he said he became aware of environmental issues when he saw the polluted rivers. Birds respect the nest, he said. We need to respect our home! One of the most interesting statements he made was in response to a question about overpopulation. He said indeed population is a big issue, and we need nonviolent birth control. The audience applauded loudly, interrupting and almost drowning him out as he explained what he meant by nonviolent contraception: more monks and nuns, not abortion. Which led him to the media. The Dalai Lama said tv and radio have a responsibility to promote values that are good for people. The Dalai Lama called out the media and petitioned them to do good! He continued to say that conflict (competition) was good for innovation, but there are some big problems that cannot be solved that way, so cooperation was needed in those cases. The solution (i.e. the game theory) is not the same for small and big problems. Though he enters the political fray, the Dalai Lama is of course a religious leader. He said people need to be more serious about religion, not just chant some words, or go to church on Sundays, or pray once in a while. We are “created by God”, so “it is wrong to exploit without caring,” and these things need to be applied every day. He said tolerance was very important, because there are all types of people–we have to take it for granted that there will be different views. With billions of people, there will be naturally different views and arguments, but we must direct our energy at combatting arguments, not people. He reiterated this point when answering one question asking how to get through to people who deny climate change. His answer was that you must first respect them, respect all people regarding of their viewpoint as they are humanity too! Listen to their perspective with respect; if not, you only make the problem worse by not communicating with the other side. Even winning an argument is not victory–the goal is to make positive change; making someone look stupid or wrong means nothing if change is not made. The way to change is to listen and respect, get the facts out there, and hopefully that will make headway. Righteous indignation is not part of your ideal response! But still the Dalai Lama’s got more bite than you’d think. People think of him as a puppy but really he’s more like a kind, gentle, though capable, big dog. And in terms of religious discussion as it relates to the environment, the Dalai Lama weighed in, saying that burning bodies and putting ashes in the Ganges is not sustainable– “it benefits only the fish!” Instead of saying “it’s our way of life,” carefully consider your traditions and ask what benefits and what harms result from your traditions. The Dalai Lama urged patience and calm in stressful times, even if the environment is going to pot. He quoted an 8th century Buddhist monk who said that if there is a solution to the problem, there’s no need to worry about it. If there is not a solution, there’s nothing you can do, so also don’t worry. In response to a question of whether political change is needed to further the environmental cause, the two scientists proposed, in turn, voter pressure on politicians and second understanding the immediate economic effects of ill environmental policies: perversely what we think helps the economy (having lax environmental regulations) is hurting it. The Dalai Lama answered that inner wealth is not the same thing as material wealth, and our educational system needs to address this nonmaterial perspective. Just like the media needs to add some positive role. He said modern education is failing because education is not complete–it doesn’t address issues of meaning and instead focuses on profit. Yet because he didn’t receive a modern education, he said to condemn it completely was presumptuous. The Dalai Lama really likes science, and is on record as saying that if science contradicts Buddhism, the Buddhist belief should be abandoned. Skepticism is good, he said. Skepticism leads to questions, which leads to research, which leads to analysis, which leads to answers. On poverty and the environment, the first scientist suggested a solution of subsidizing good behavior and penalizing bad behavior for developing states. The second scientist said that it’s tough to eliminate fossil fuel usage (i.e you can’t change the minds of powerful, rich nations) and developed carbon emissions but we can address other forms of pollution and environmental change in poor countries, such as burning cow dung for fuel. By replacing each cow dung stove for $40 in poor countries, you can eliminate this source of pollution–a $10 billion fix for a multi-trillion dollar problem. The second scientist continued, saying that the stone age didn’t end because we ran out of stones–and so hopefully the fossil fuel age will end before we squeeze out every drop of oil. 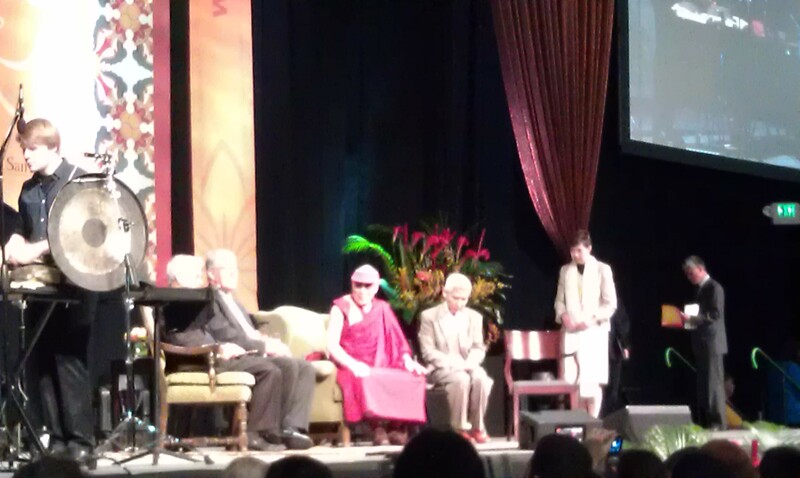 The Dalai Lama is probably the highest profile person I’ve ever seen with my own eyes. The best other contenders are Nelson Mandela, almost Pope Benedict, and Bob Dylan (who shook hands with the Pope rather than kiss his ring). I remember Mandela being vaguely warm and inspiring. Though I more remember Rice President Malcolm Gillis stumbling as he walked across the stage. I was kicked out of the Vatican when trying to see the Pope. Yes, literally escorted to the gates and barked at by some grumpy guard. So, though I held a ticket in my hand, I watched the weekly audience on a mega-screen projected from the outside (more details in the trip summary here). You gotta see such an important figure in person–more powerful and way more memorable than watching some videos. It’s the lazy man’s way to inspiration! Thanks Kristy for the photos! This entry was posted in Great Nature, Pondering, San Diego. Bookmark the permalink. Great post, love the photo. Love the content from HH. Heard similar things from another monk here in Seattle a couple months ago… education should include values (other than consumerism).